I have been seeing tri-shutter cards all over the stamping blogs and especially loved one done by Dayanna Donng, so much so that I ordered the Cottage Wall Designer Series Paper. With my card I chose to use some different "sides" of the paper, but her card was my inspiration and I thank her for sharing. Click here to see her beautiful card! This card was not as difficult as I first thought it would be, but it still required more of my time than the average card. A lot of time in selecting paper and cutting all of those little pieces, but now tht I have the measurements I look forward to making more of these fun and beautiful cards. I am showing two views - partially folded from the front and a wide open view showing all of the panels. Hope you ejoy this newest card. Papers I used were Lavender Opulance, Old Olive, Whisper White and Cottage Wall DSP. Pearls on butterfly are from the Pretties Kit, as is the white flower. 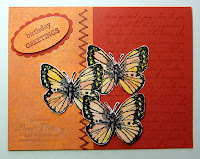 Butterfly is punched using the exclusive to Stampin' Up! Butterfly die and the Big Shot. My advice - try something new, it probably won't be as difficult as you think and well as you can see the results are worth the trouble! Happy Stamping. I'm featuring a stamp set from our Hispanic catalog and idea book, celebrando creatividad, called Flores suaves. I love butterflies, bees and roses and this set has them all! For this card I chose the butterfly and the background stamp with writing on it. Unfortunately I don't know what it says, so I'm just hoping it goes with birthday! LOL It's stamped very faintly on the card, just to add interest so I'm sure it will be fine. I stamped the butterflies on watercolor paper using our black craft ink and embossed it with clear embossing powder. I then used my aqua brush and watercolor crayons, yoyo yellow, ruby red and chocolate chip to color in the butterflies. As many of you know I love to cut out, so yes the butterflies were cut out using my paper snips and applied to the card using dimensionals. I stacked them for the top butterfly to lift it up even higher. The sentiment is from On Your Birthday, layered with the large and scalloped oval punches. The paper is Dusty Durango and Razzleberry Lemonade DSP. I created this card from a sketch on SUDSOL today - Darla used for her Chat & Challenge. I join in on this as often as I can - it's fun to visit with other demos and it's always good to have a challenge. Try it yourself - find a card in the IBC and try to make it. Pick your own colors, paper and stamps, but use the layout. You will be amazed at how different your card will look and how it will give you that extra push to try something new. Work from my card today - but most of all have fun! Build-a-Roo is one of the cutest sets in the new IBC - I knew I had to have it immediately when I saw this momma and her baby. This set is from the Australia catalog and I'm so glad Stampin' Up! let us have it here in the US too. It is what is known as a two-step stamping set - meaning you use two stamps to complete your image. This set comes with some really cute combos, flowers, hearts and a baby roo. There's a single heart, flower and gift that could be put in the roo's paw. I used the baby roo and the peek-a-boo-someone new! for a friend who recently had a new baby. You see how the big roo has her arms outstretched - well, there's a I love you this much stamp you can use with that and some hearts to be in her pocket! How cute is that? So this is a versatile set. I cased the idea from our current IBC, you can see the original on pg. 63. I used So Saffron , Chocolate Chip and Bashful Blue (looks different in picture) for my card colors. Ribbons are chocolate chip 1/2" grosgrain and So Saffron striped grosgrain. I used watercolor paper for the roo and cut her and her joey out separately. I adhered her joey with dimensionals so he/she popped out away from her, but still was in the pocket. This is a fun set to work with - you might want to think about adding it to your wish list! 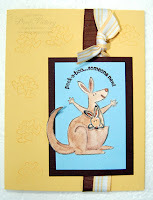 Keep your eyes on my blog for more roo cards in the near future. Thankfully, I'm not! But unfortunately a friend of ours is, so I made him this card. I love this little stamp set - just three stamps, but great for guys and children and a "praying for you" sentiment stamp. I totally cased this card from the catalog - you can see the original on pg. 60 of the IBC. I changed the colors around because I didn't have the black and white ribbon, and I used the "retired" buttons, but the look is the same. I love how mine turned out. It's an easy card to make and the layout would be good with many different stamps - so now it's your turn. Pull out a favorite stamp of yours and use this layout and make your own fun card. I don’t know about you, but there are times I see a stamp set and I just can’t wait to get it and then for some reason I wait a very long time to make the actual purchase. Well, I did that with A Rose is A Rose (pg. 99 - IBC.) To make matters worse, when it finally arrived I put the rubber on the wood and put the stamp set on the shelf. I must admit all of those pieces (it’s a two-step set) scared me a little. Finally last week I got it out. I used a template from Mary Director for the Joy Fold Card to make this wonderful fold out card. She used Animal Stories and the coordinating Tall Tales DSP (pg. 181 – IBC) and my card was for an adult, so when I started thinking about stamps I was drawn to this beautiful rose set. Surprisingly, it was much easier to use than I thought it would be and with the Staqmp-a-ma-jig, the pieces lined up easily. If you don’t have the Stamp-a-ma-jig, (pg.191 – IBC) order one! You can place an order with me or your favorite demo, but it will make your life so much easier! Now on to the card! The first thing you may notice is the paper color. Yes, both the green (kiwi kiss) and the pink (pirouette pink) and Bella Rose DSP are retired, but the recipient is a club member and these are some of her favorite colors and so I used them for her card! I may not demo with them any more, but I can still use them for friends and family! 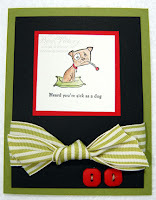 This card was so much easier to make than I expected it to be and makes a wonderful presentation. The best part is you can change it’s look to be right for anyone at any age. I used one of my favorite sentiments from On Your Birthday (pg. 139 – IBC). This is a very versatile set! Now it's your turn! Pull out a stamp set you knew you would love, but haven't used and use it! Copy this layout or find one you like more, but use those stamps - get ink on that rubber and discover the reason you bought the stamps in the first place - and most of all have fun! Several days ago I mentioned an anniversary card using some retired stamp sets and here it is. For those of you who have these sets you will enjoy a new way to use them; however, they are sentiments so perhaps you have these words in other sets. My best friend and I met 35 years ago - shortly after I moved to Houston. I was in her wedding and amazingly they just celebrated their 31st anniversary. Not amazing that they're still married (LOL), but amazing that it's been 31 years! My mom always told me that anniversaries were more private celebrations than public ones, but since I was in this wedding I try to remember it each year. This is the card I made for them. I used Rich Razzleberry, Whisper White and Razzleberry Lemonade DSP. I used the calendar and the heart from Mark the Date, the month came from Full Calendar, the numbers are from Calendar Alphabet & Numbers, Love on the outside of the card and Celebrate on the inside are both from the retired set All about U and the congratulations on the inside is from one of this year's Sale-a-bration sets. I used the Rich Razzleberry polka-dot ribbon and the Heart to Heart punch. I thought the punch was a really great touch. I used the Scallop Oval punch and the movers and shapers matching die for the love and celebrate. I don't get rid of my retired sets. They aren't that old since I've only been a demo for a little more than two years and I got them because I liked them. Eventually I'll have to part with some of them for space purposes but that will be a very sad day. For now I just crowd them in and am happy to use them when I can. 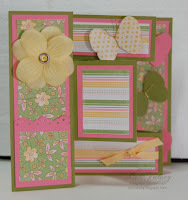 My challenge to you today is to pull out an old set you haven't used for a long time and make a card! You'll be glad you spent time with an old friend. I know I promised an anniversary card, but I want to be sure it's been received before I post it, so it will be a couple of days. Today I want to feature a birthday card using the Humor in High Heels stamp set. This card was CASED (copied and selectively edited) from our 2009-10 Idea Book and Catalog. This is a fun set with so many different combinations, but I was late for a birthday this week, so I used the "I didn't forget your birthday, I'm just fashionably late. I stamped the dress on Razzleberry Lemonade DSP and cut it out, cutting of the hanger. I stamped the dress again on Dusty Durango and placed the cut out dress on top with dimensionals. The card is Crushed Curry, one of the in-colors for 2009-10 and Old Olive for the strip on the bottom punched with the eyelet border punch. 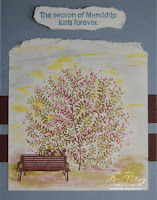 Sentiment stamped on Whisper White and edges torn and highlighted with Dusty Durango Ink using a sponge dauber. The finishing touch - Crushed Curry polka dot ribbon. A fun card - that helps make up for being l ate! We made the same card at our August club, using much more neutral colors. 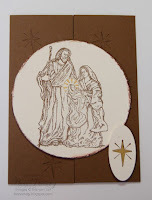 We used So Saffron, More Mustard, Chocolate Chip and Very Vanilla - same card, different colors - different look. The dress on this card used the So Saffron DSP and we added a little bling with a rhinestone brad for a belt decoration. I love how you can change a card so much by the color choices! I really like this set and you will be seeing more. Be happy - make a card, make someone else happy - send a card! I told you I would be posting the card I made for my husband. This was a case from the catalog - mine is similar, but not the same for sure. If you look closesly you'll ses that I put SU on the shopping bag tags. That really is where I do most of my shopping these days. LOL In fact, I'd gladly give up the shoes and the chocolate for more stamps! Now admit it many of you would too! Enjoy, tomorrow I'll be back with an aniversary card - I don't want to post it until it's received! The best part n it is that I used "retired" stamps. I know we don't want to demo with them, but I believe those of you who own some of these sets would love to be reminded of the fun ways to use them! 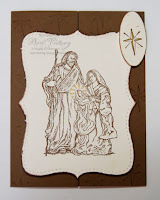 Until tomorrow - pull out a stamp set and make two entirely different cards. It's a challenge - let me know how you did. I love this set! What woman doesn't love to shop, new shoes and chocolate - I don't know one. Oops, I do know one, but I'm suspicious of someone who says they don't like chocolate! How about you? Anyway, this is one set that you can and probably will use every one of the stamps in the set on one card! We are using this set in stamp club this month, but I've also made a card for my granddaughter (18) and my husband, just this week alone. I can see a bright future for this set in my life. This card is the one I made for Katie, tomorrow I'll post the one I made for Bill. See you later, got to go stamp! I'm having fun playing with new goodies from the Holiday Mini preorder! Catalog goes live for everyone September 1 and it is filled with so many fun holiday items. One is the new shimmer paints - available in three colors, Champagne Mist, Frost White and the Plantinum I used for this card. I love the new Delightful Decorations stamp set. It is in the shape of Christmas oraments and so much fun. The are a perfect match for the new Ornamnet Punch. A previous post showed the card I made with the punch and the matching rub-ons while I was waiting for my stamp set, but I've go it now and so get ready - there will be many posts using this set. 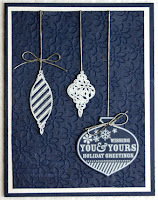 The small background snowflakes were stamped with the shimmer paint and a small stamp also in this set. I love my stamp club! What an amazing group of women. We laugh, we share and we stamp. Some of us are fairly new to stamping, some have been doing it for more years that we can count, but we learn from each other and we share and in the past year we have become friends. I love having everyone in my home - I love watching everyone try new things, some times making it perfect on the first try and sometimes not, but laughing and having fun. Last night was our Tuesday night club - there will be another gathering on Thursday afternoon with more fun ladies. I try to have three projects each month and hopefully we will learn something new or use a different technique. This month I CASED a card from Sandi Maciver. Click here to see the original card and look for the August 5 post. I changed very little, but a few things including the color. I chose Regal Rose and Soft Suede and because I didn't have the same ribbons, I had to make a change there too, but this card is all Sandi and I'm so thankful for her talent and her willingness to share. 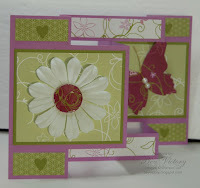 I love this card because it uses two new products - the Medallion background stamp in a most unique way (leave it to Sandi) and the new butterfly punch. I hope you enjoy - wouldn't you love to receive a card like this in your mailbox? Watch for the other two projects - they'll show up over the next few days! Now it's your turn - find a card you love and try to make it. CASEing is a compliment - just be sure to give credit to the originator. Thanks again, Sandi! I have had so many requests for the measurements etc. for the Gift Tag Box. 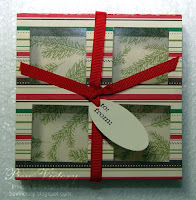 What makes doing a tutorial for the box so difficult is that I used a pattern from Stampin' Up! for the box, a tutorial from Valerie Stangle for the dividers and I came up with the box top on my own. 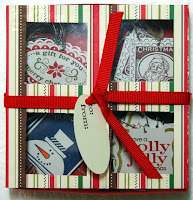 The complete tutorial for the original Gift Tag Box I started with can be found at Valerie Stangle's blog - Click here for tutorial. This is an incredible tutorial and I really would not be able to improve upon it. The box bottom is very stable and secure - and easy to make following her instructions. The lid to her box is made with a clear lid, like the one in the IBC, pg. 14. 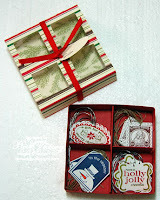 I have made one and love it, but for the simple Christmas gifts I want to make, I looked for a little bit easier box and found it on the Demo site for Stampin' Up. So, when I made my box I used her tutorial for the dividers and the slightly easier box pattern and my own idea for the "window pane top". The simple box I used also had a divider pattern - my reason for not using it was that it used more paper, however, you can email me for the pdf file for this easier box and divider, and choose for yourself which you want to use. Now for the lid: Cut a 4" x 11" piece of Designer Series Paper. You can actually get three tops out of one piece of 12x12 paper. Now using a score pal or paper cutter with scoring blade, place the paper long side at top and score at 2-1/2", 3-1/2" 7-1/2" and 8-1/2". I made this template first. Then on the back side of the DSP I drew the squares on the paper and new exactly where to place my 1-3/8' square punch. The borders around the window panes are 3/8" and the cross pieces are 1/2". You can draw the pattern out on the back of the paper with or without making a template, but I suggest the template if you plan on making more than one box. Cut a piece of clear window sheet (pg. 158, IBC) in a just slightly less than 4" square - you can actually use the measurement of 3-15/16 or estimate just slightly less than 4", which is what I did. Place sticky strip on the back side of the DSP along the border and the cross pieces. Place your square of clear window sheet down and then fold on the score marks. Wrap around your box and make sure it will slide. Mark where to place sticky strip. Place the sticky strip down and adhere the two ends. Top is complete and ready for you to embellish. I placed my ribbon and tag on the top so that it would remain as the box was slid in and out. You could also tie it the other way to hold the box securely. That is strictly your option. Here's the finished top as I made it. I'm sure as I make more I will change up various looks - ribbonss, tags etc. And as I have spent time writing this - I've thought of many other uses for this quad box. Candy pieces, small stamps, and all season gift tags! I'm sure the uses are endless. Thanks to everyone for their interest in my box and for making your way through this first attempt at a tutorial. Believe me this is much easier than I've made it sound. I can tell you that I appreciate everyone and their tutorials so much more now! Now it's your turn - be sure and send me pictures! As I said I got the idea from our Idea Book and Catalog, but then it was finding he pattern for the box. My box is actually made from three parts - the box is a very simple box I got from a pattern from Stampin' Up! The dividers are from a tutorial from Valerie Stangle - see her entire box tutorial at http://valeriestangle.blogspot.com/2009/07/whispy-blooms-tag-box.html. Her design for the dividers is fabulous and uses a minimal amount of paper. In fact, wih my box pattern and her dividers I made my box only using one 8 1/2 x 11 sheet of card stock and I got three tops from one sheet of designer series paper! The only other part of the box top is a 4" piece of clear window sheet for the box wrapper. I cased the wrapper idea from our Match box die - really easy to make. I wanted everyone to be able to see what was in the box, thus the window sheet and four squares made with our 1-3/8" square punch. I stamped the tags using pads for the solid colors and markers for the red and green, adding a touch of orange to the snowman's carrot nose. I punched a 1/16" hole and used silver elastic cord with two of the designs and linen thread with the other two. I slid the box into the wrapper and tied a piece of 1/4" real red grosgrain ribbon around the box and added a gift tag of my own. I tied the ribbon in a direction that it doesn't come off when the box is opened. I hope you enjoyed seeing my Christmas tag box and please act surprised if you are one of my friends that receives a little box for Christmas! I've been working on some great ideas for Christmas presents and will have pictues up soon, maybe in a couple of hours, but I just had to tell you that I've added Google Follow with Friend Connect to my blog - check out the right sidebar! This makes it so easy to know what I'm up to on a regular basis. I hope many of you will click on the follow button and become a regular on my blog. Check back later today for more updates. If you follow my blog at all you know I love Night of Navy! Here is my latest Christmas Card featuring Night of Navy and Whisper White. I was fortunate enough to have a new package arrive yesterday (I love Mr. Brown) anyway, it included a few things from the new Holiday Mini catalog (you will be receiving one soon - if not from me, from your favorite demonstrator) and WOW is all I can say! I love punches! And Stampin' Up! has out done themselves this time. It's an Ornament shaped punch! Now to make things even better they have done a stamp set, Delightful Decorations and rub-ons in silver and white - Merry & Bright. Unfortunately my stamp set is on backorder, but I could still play because I have the rub-ons. These rub-ons are incredible - the best ever and so I rubbed the design on to a piece of Night of Navy, positioned my punch and voila! the rest as they say is history. A perfect ornament with almost no work. The other two ornaments are from the fun set Tree Trimming (pg. 28 IBC). I used the new impressions folder for the background - it , too, will be found in the new mini - Petals-A-Plenty. I used the debossed side - liked it better for this project - but both sides are beautiful. Hope you enjoy - now it's your turn to get into the Christmas Spirit and get started on your cards. I had an idea yesterday to use the fabulous lattice die (pg. 198 Stampin' Up Idea Book & Catalog) and then punch out a design, well that fell flat as a pancake! But I just couldn't give up - I kept playing with the punched out lattice and began to cut it into shapes. Now I had some great shapes, but what to do with them? Suddenly I thought of decorating Christmas tree ornaments. So I got out my Circle Scissors Plus(pg. 199 IBC) and cut a 3" and a 3 1/2" circle for the ornament base shape. I ran brushed silver paper (pg. 159 IBC) though my crimper (pg. 188 IBC) and then used the round tab punch (pg. 187 IBC) to make the top of the ornament. I placed my various shapes on the round circle. Glued on the top, punched a hole and used silver cord for the tie. Here are the results. The paper colors are Night of Navy, Real Red and Rich Razzleberry. I think they're pretty cool and I use all handmade ornaments on my tree so this will be a great new addition for this year. Now as a disclaimer, if someone else has already done this, please forgive me for taking credit. I know I've seen the ornament shape, but I think I thought of the lattice design - if not, please let me know so proper credit can be given! I included a picture of the lattice in the shot so you can see how I cut it. 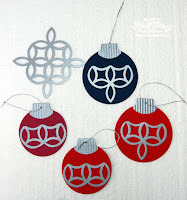 I will be using just the lattice with a hanger as part of my ornaments - it is beautiful by itself. My next set will be made with the Brushed Gold cardstock (pg. 159 IBC) and some different colors and I'm going to make a card with this design. Check back tomorrow for the next edition. I will also post a cutting tutorial with pictures soon. Must take the pictures and time is short today! Happy Stamping . . . I love this set! I know I've said that before, but here's another reason - the tree is in bloom! A friend of mine was looking at one of my other cards made with this set and mentioned that it just might be very pretty with some flowers. So I had to give it a try. I pulled out the Branch Out set for the flowers (this set is dormant and not in the 2009-10 catalog, but still available for purchase) and Season of Friendship for the sentiment. The base card is Bordering Blue, the strips are Chocolate Chip textured paper and the base for the stamp is Whisper White. I used dimensionals to pop the bench and the sentiment. Stamp pads and watercolor brush were used for the ground and sky. Now it's your turn - take a stamp you use all of the time and change it up! Have fun!